The Certified Travel Industry Executive (CTIE) program is designed with the in-demand skills needed in today’s leaders. It is more than just “being in charge.” A leader needs to be sure that they are focused on goals that are aligned with their company and that they have a team behind them that is focused on achieving those goals as well. Each of the online course topics builds upon each other – and you will see how the courses create a complete leadership preparation program. After identifying your leadership style with the DISC Leadership Styles course; the leadership core components (Becoming an Excellent Leader, Strategic Leadershipand Transformational Leadership) are crafted to make you more effective, able to properly apply the organization’s core values, and meet the challenges and obstacles along the way. Knowing how your employees and co-workers think and “operate” and how to get the best work from these people is the essence of the Coping with Change and Emotional Intelligence training. Using these personnel skills, you will soon be leading an organization that is a well-oiled machine. Achieve leadership excellence by learning how to create followers, motivate employees, and build a leadership team. Learn how to coach people to higher performance by adapting your leadership style to the specific coaching situation. Learn how to develop an action plan to manage your response to change and help your colleagues work through change, too. Learn what creativity is, what rules we place on it, and how it can fit into the workplace for positive results. Identify the DISC personality styles and learn the best strategies to use to lead each type most effectively. Learn how to better understand emotions in order to be more productive and develop greater relationship skills. Learn how to identify your negotiating style and the styles of others in order to build effective negotiating strategies. Improve your leadership skills by creating or reviewing your vision, mission, and value statements. Learn what makes a winning team and tips for ground rules, roles, and responsibilities. Explore six different types of teams. Discover new ways to lead your organization during times of change by learning to focus on what’s most important. $550 per individual, including access to all videos and supplemental reading. The registration fee covers the course materials, CTIE Exam, and evaluation of the paper or project. Payment plan available to help fit the cost of certification into any budget. Every day, owners and executives from the retail agency side to the supplier side of the travel industry are faced with leading the growth and development of their organizations. To lead an organization through growth requires creating and applying the organization’s core values, goals and objectives, developing a cohesive team of employees through encouragement and coaching, keeping an open mind for creativity and opportunity, all while leading the many aspects of change. 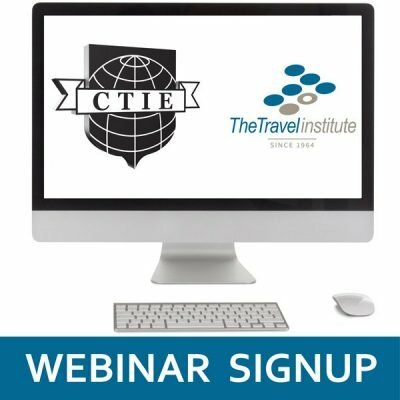 Join Patty Noonan, CTC as she dives into the tools inside of the Certified Travel Industry Executive (CTIE) program designed to help you build and perfect the many skills required by today’s and tomorrow’s executives. Certified Travel Counselors (CTCs) are required to earn a minimum of ten Continuing Education Units (CEUs) per year to maintain their certification. 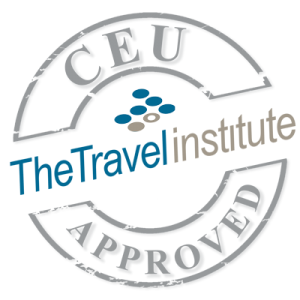 In addition to being a member of The Travel Institute, our CEU requirement is an effective way to master new skills, attain product knowledge, remain current on industry trends, and continue to develop your role as a travel professional.